Home » Blog » Word » History » Did you know…Tahoe has the Highest Lighthouse in North America? It’s not easy to spot, especially since it has been out of commission for over 80 years, and it doesn’t look like a lighthouse. But, it’s well worth the short hike in D.L. Bliss State Park on the west shore to see this historic piece of Tahoe’s early mariner days. Erected around 1916, the lighthouse is not tall and round like you see on the coast. Instead it’s a small, square wooden structure that sits about 200 feet above the lake that served as a navigational beacon. It’s often mistaken for an outhouse…boy, what a view! After only three years of operation, the lighthouse was abandoned in 1916 due to hardships getting supplies and tending to it year-round. For the next 80 years it was largely ignored and left to decay. In 1997, however, the state stabilized the lighthouse to ensure it wouldn’t disintegrate into the surrounding forest in D.L. Bliss State Park. 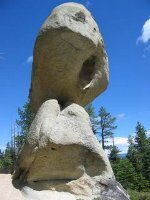 While you’re in the park, don’t forget to check out Balancing Rock. A massive rock weighing 130 tons balances above a second boulder with only a thin membrane of stone connecting the two giant rocks. For more information about the lighthouse, be sure to visit the Gatekeeper’s Museum in Tahoe City that includes extensive photos and memorabilia of Tahoe’s boating and other cultural history. To get there: D.L. Bliss is just north of Emerald Bay on Hwy 89. 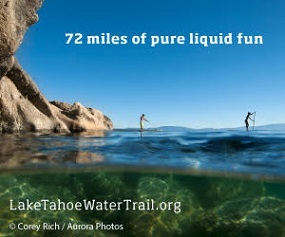 For the really green adventurer – ride your bike or paddle over in your kayak along the Lake Tahoe Water Trail. Duane LeRoy Bliss was a 19th century lumber baron who owned nearly 75% of Tahoe’s shoreline as well as the local steamboat line, the train system, and a variety of other businesses. In the 1930s, his family donated about 800 acres of lakefront property to the State of California for the park. The state later acquired more land to its current size of 1,200 acres.